Identifying birds isn’t always easy in the Rio Grande Valley. Young birds don’t always come into their adult markings until they are a year or more old. In the field, or in your backyard, when you see an unusual bird you’ve not noticed before, scout the area through your binoculars. You’ll most likely see a familiar-looking adult bird close by that will lead you to correctly identify the unusual-looking bird. Such was the case while I was recently photographing a weird-to-me bird on a resaca retaining wall. As I lowered the camera, I was startled to note an adult black-crowned night-heron just below the bird I was photographing. It was quietly perched, in deep concentration, on an old log that was sticking up near the water’s edge. I thought it a safe bet that the unusually colored, tan-feathered, white-spotted bird perched on the retaining wall, must be a juvenile of the black-crowned night-heron on the log. Prior to noticing the adult bird, I observed the size and shape of the unknown bird. Both adult and juvenile black-crowned night-herons often tuck their neck into their body, which gives them a hunched-back profile. More clues to help with bird identification can be size and shape of the bird’s bill or beak. The juvenile’s bill, in this case, was just beginning to show color — pale yellow. 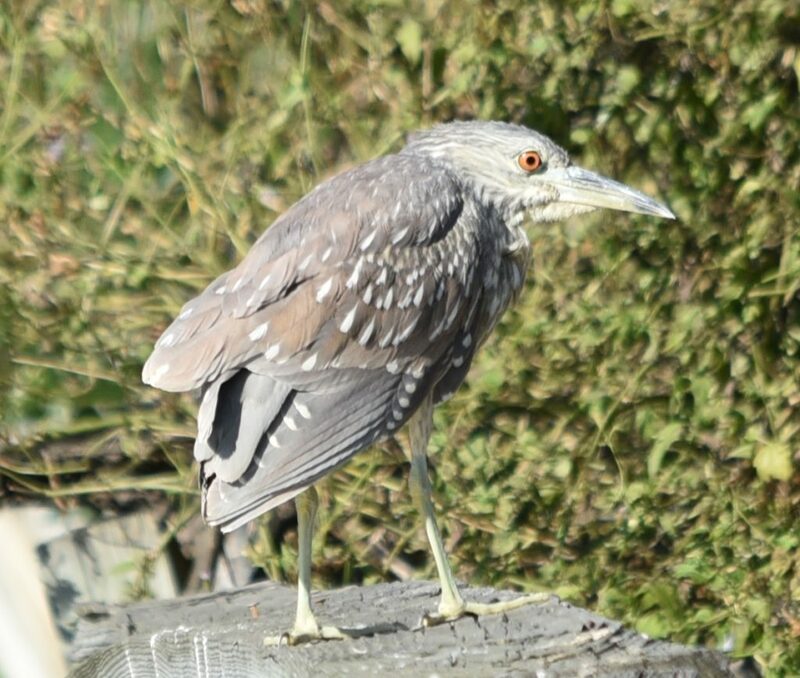 The Valley is home to two night-herons as permanent residents, the black-crowned and the yellow-crowned night-heron. Black-crowned night-herons are social birds and tend to roost and nest in groups. During the day, across the resaca, some 35 night-herons conceal themselves among branches and foliage of the trees on the far bank. True to their name, night-herons forage generally in evening and at night in water and on land. 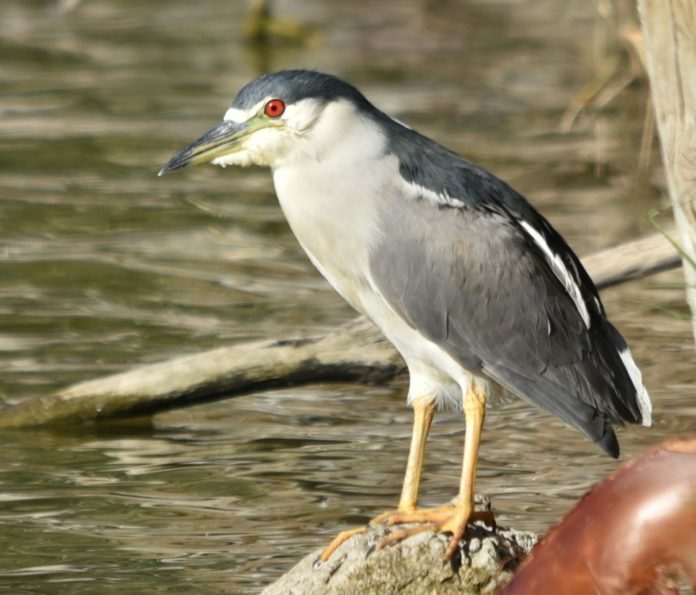 Black-crowned night-herons are opportunist feeders and eat many kinds of land and marine animals, including insects, earthworms, crayfish, clams, fish, lizards, snakes, rodents, carrion and garbage from landfills. Their Valley habitat is near wetlands, marshes, resacas and irrigation ditches. Yellow-crowned night-herons are more solitary than black-crowned night-herons, although they will roost near the larger scattering of black-crowned night-herons. The yellow-crowned birds feed primarily on freshwater and saltwater crustaceans and many species of crabs. Hone up on your bird identification skills and get prepared to join in on a big annual international event Feb. 15 to 18 — the Great Backyard Bird Count. You don’t have to leave your backyard to participate. Instructions are at the following website, www.gbbc.org, which has information about this free program that was the first online citizen-science project that collected data on wild birds and displayed results in near real-time. The Great Backyard Bird Count is led by the Cornell Lab of Ornithology and National Audubon Society, with Bird Studies Canada and many international partners. It is powered by eBird; the count is made possible in part by founding sponsor Wild Birds Unlimited.